Risk-taking ministry can transform the world. In 1885, a fire sparked inside the heart of 26-year-old Henry G. Appenzeller at the chapel of Drew Theological School’s Seminary Hall and ignited a willingness to step out in faith. The result was an entire country forever transformed. Kneeling before the chapel’s altar, Appenzeller responded to his calling by making a commitment to bring the gospel to Korea, where he introduced and established a United Methodist movement. 130 years later, the very same room was packed with decedents of his Korean church plant who traveled across the globe to pay homage to his sacrifice through gratitude, commemoration and a special memorial. 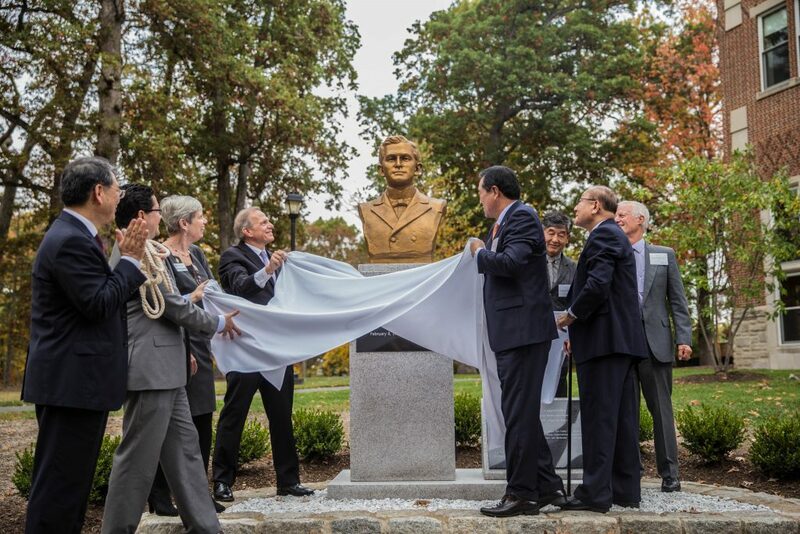 On October 21, a bronze bust of Appenzeller was dedicated on the campus of Drew Theological School as a gift from the Chungdong First Methodist Church in Seoul, South Korea. Started in 1887 by Appenzeller, Chungdong remains vibrant as the country’s largest Methodist church, many of the country’s leaders including the first president having come through its doors. Appenzeller’s roots can be traced back to Greater New Jersey and Drew Theological School, where he received his education, as well as Green Village UMC where he served his first pastoral appointment. Leaders from Chungdong and Drew and John Huyler, a great-grandson of Appenzeller joined Bishop Schol in dedicating the statue with words, music, dance and prayer, including Chungdong senior pastor, Rev. Dr. Ki Sung Song, and Drew President Dr. MaryAnn Baenninger. The moving dedication symbolized a homecoming for Appenzeller’s legacy. “For the people of Chungdong and Methodists in Korea, it’s as if Appenzeller came to Korea, gave himself up, and now 130 years later, we’re expressing our deep gratitude by bringing him back,” said Sehyoung Lee, Chungdong’s pastor of English Ministry. A pioneer spirit, Appenzeller arrived in a Korea shrouded with uncertainty, but with trust in God. He founded a church, started a school, assisted in medical missions, and focused on Bible translation. Rain caused the event’s liturgical opening service to be held fittingly inside the chapel Appenzeller was sent forth from. However, the weather cleared, and the crowd gathered outside around the veiled bust and joined Bishop Schol in prayer. “The face frames the soul,” said Schol, after the statue was unveiled. “This pathway, this ground will forever be framed by the face of Henry Appenzeller.” Schol stated that he hoped the monument would serve to inspire others to leave the familiar for the unfamiliar to serve God with the courage to say, “Here I am, Lord.” Immediately following Schol’s benediction, a sudden burst of sunlight lit the statue as if on cue from the divine. Participants gasped with awe and applause at the powerfully moving moment, joining to sing “How Great Thou Art” in Korean.